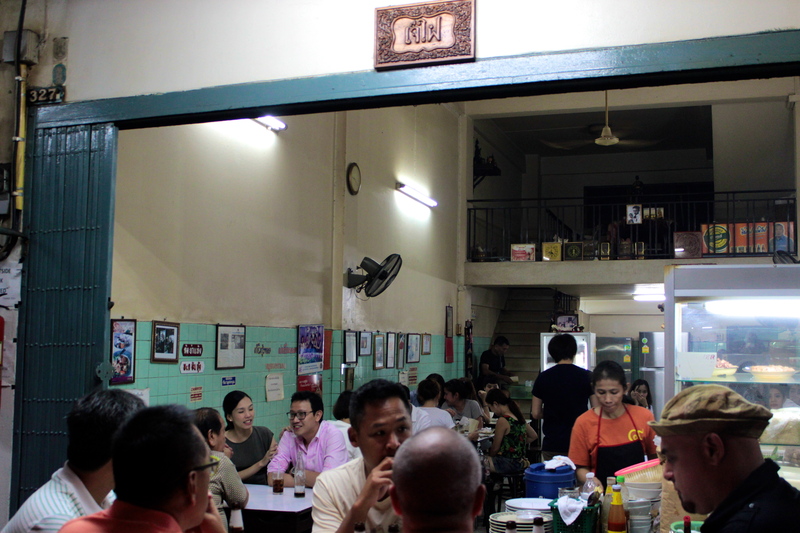 This evening I went back to Raan Jay Fai for maybe my sixth time. I came here for the first time about five years ago…and that was the beginning of my love story for Jay Fai. Jay means ‘sister’ in Thai-Chinese and Fai means mole, as in a beauty mark (not the subterranean mammal). Sister Mole does indeed have a very prominent mole on her face and I love that she’s embraced it as the namesake of her restaurant. But mole story aside, this woman is one incredibly tough and talented cookie. She’s 68 years old and wields a wok more skillfully than anyone I’ve ever watched cook. It could have to do with the fact that she’s been cooking here for 50+ years. 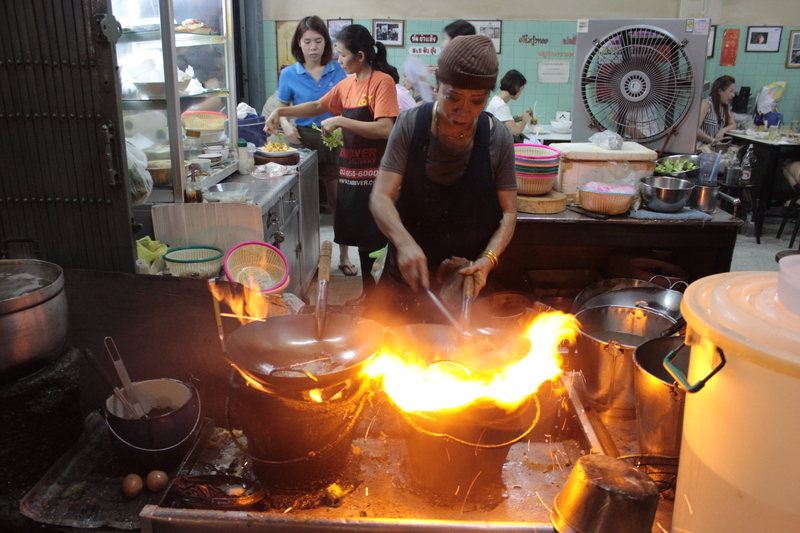 I am in complete awe when I think of how many pad kee maos or tom yum koongs she has cooked. When you watch Jay cook, it’s like watching a perfectly orchestrated symphony. She practically dances around her small outdoors kitchen, adding oil to the blazing hot wok, putting together her basket of seafood for each ordered dish, blanching seafood, coordinating with the servers, and doing this all while standing over two fires that whip and blaze flames that would otherwise summon firefighters in the States. As a cook myself, I look to her like an aspiring film student would look to Steven Spielberg, or a young singer would look to Madonna. Jay’s the ultimate- she’s got talent and longevity, and she makes things that you put in your mouth and result in joy! What’s better than that? We sat at a table just off to her side and watched her cook every single dish for every customer with precision and accuracy. She let’s the noodles scorch just enough, catching the wok, so they’re smoky but not burnt. 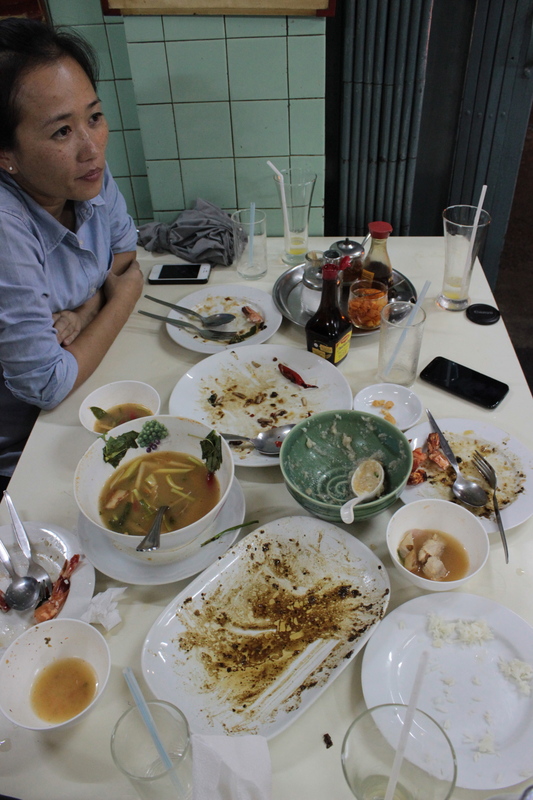 She adds each bit of seafood so that the shrimp, squid and scallops are each cooked to the proper done-ness. And she adds the basil leaves in at the last moments so that they only slightly wilt but don’t disappear with the heat of the wok. After 50+ years, she’s got it dialed in. 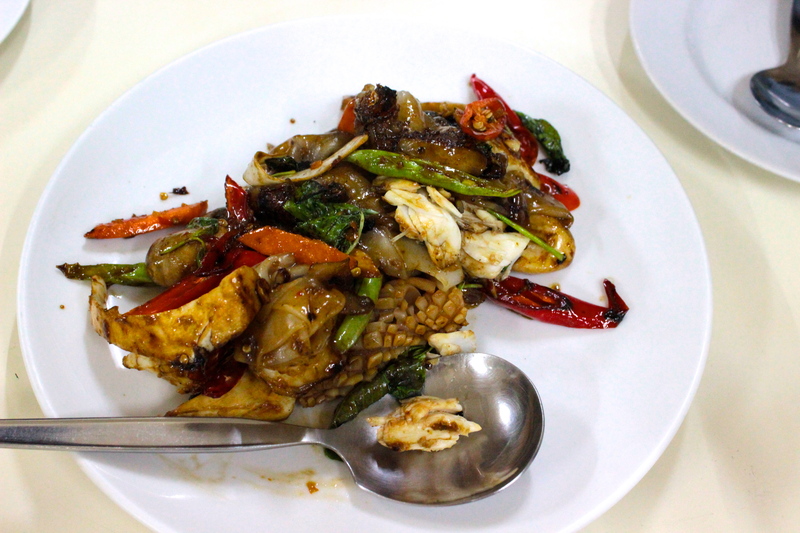 The first dish we ordered is also my most favorite dish, pad kee mao. Though she made the portion large enough for three, I would have happily eaten this dish all by myself. It’s honestly nothing shy of wonderful. We also ordered her tom yum koong, which is very different than most versions I’ve had. The broth is clear and boldly seasoned, veering on the side of salty, but not. It’s finished with a strong twist of lime. It’s a punch-to-the-jaw kind of soup. We tried a dish that she’s also known for called congee hang, or dry congee. I was a bit stupefied by the idea because congee is rice that is cooked in either water or broth until it’s porridge-like, even soup-y…so I wasn’t sure how this was going to work. But basically it’s like a congee that has been cooked down until it’s incredibly thick, almost paste-like. It comes with Maggi to season at the table, and with the addition of a few orange chilies in vinegar, it perks up. It’s a nice dish, but I don’t think I’d order it again. 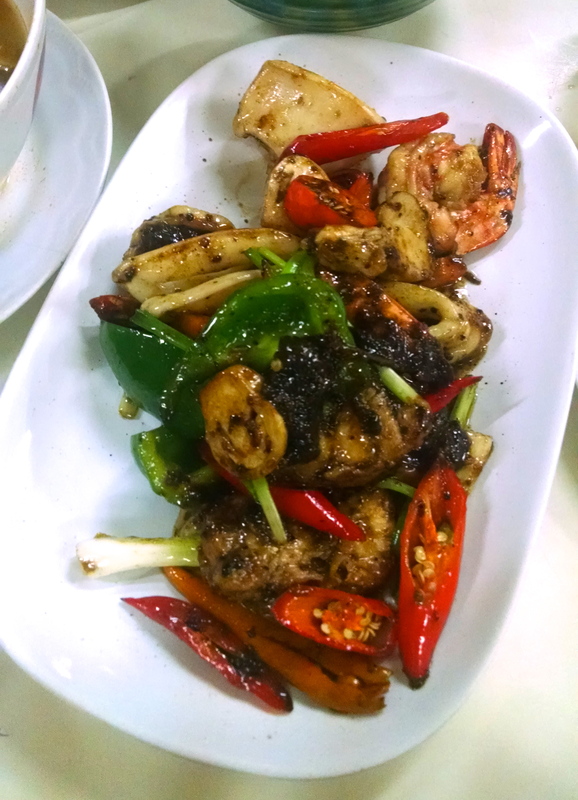 Another stellar dish she does is seafood fried in a black pepper sauce. 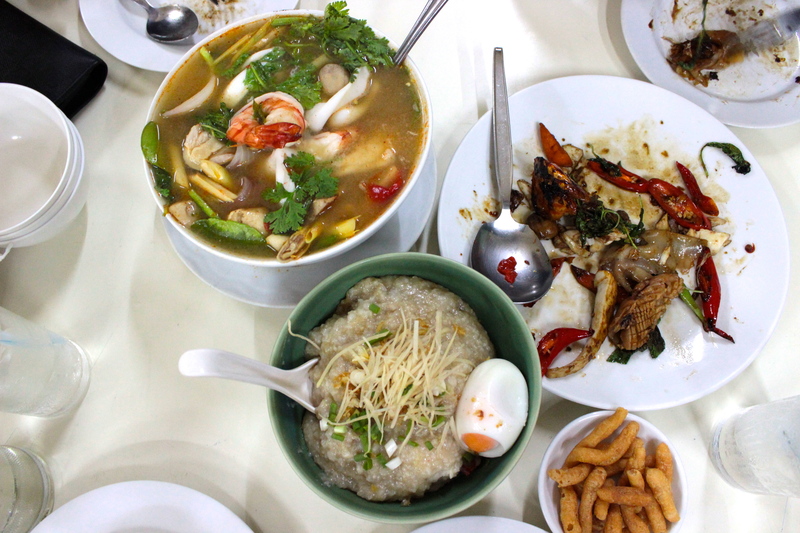 Let me just say that you’d be a silly, silly person for coming to Raan Jay Fai and not ordering this. It was Nhoi’s and Danny’s first time eating here and it was fun to watch their faces as they watched Jay Fai cook. They both are cooks as well, so I thoroughly enjoyed watching them watch her with the same adoration. You can’t help but watch her with reverence, if not worship! Previous Post Taste the Day, and Then Keep on Tasting!